We think of air as being just good old oxygen and what we breathe in deeply to relax and release stress Stressed At Work? How To Relax & Focus In An Open Office Stressed At Work? How To Relax & Focus In An Open Office Does working in an open plan office kill your productivity? You can probably blame the Germans for its wide adoption. But let's reconcile after you tried these tips. Read More . Yet, you know there’s other stuff in air. Sometimes those things can make us feel yucky, or even make us sick. So how do we even know these things are there? What can we do about them? To get the best possible air into our lungs, we need to do a few things. First, we need to check our indoor air quality (IAQ). Then, depending on what that tells us, we may need to purify our air, or change the moisture content. Moisture content in air is properly known as relative humidity (RH) and is measured in percentage (%). Let’s take a look at checking your IAQ, then filtering, and then humidifying or dehumidifying. We’ll also look at some impressive devices to help with each step. Not only can these devices improve your health, they could end up saving you a lot of money. Keep reading to the end to see how that works. If you have serious medical issues or concerns, you should hire professionals to do IAQ testing. They’ll come by with their highly calibrated sensors New Biosensors Will Turn Your Smartphone Into A Tricorder New Biosensors Will Turn Your Smartphone Into A Tricorder When it comes to health, new smartphone sensors have the potential to turn you phone into a medical tricorder right out of Star Trek. But what will you do with them? Read More and do a survey of your home or office. Once sampling is done, they’ll go through the data and put together a report How to Integrate Excel Data Into a Word Document How to Integrate Excel Data Into a Word Document During your work week, there are probably lots of times that you find yourself copying and pasting information from Excel into Word, or the other way around. This is how people often produce written reports... Read More for you. If there are air quality issues Canary Home Security System Review and Competition Canary Home Security System Review and Competition Canary is finally here: "the first smart security device for everyone". Is it the last word in affordable home security and monitoring systems, or just another overpriced and glorified webcam? Read More , they’ll often provide some advice on how to deal with them. Seems like a lot to do if you’re only mildly concerned, or just suspect that your IAQ could be a bit better. In that case, consider one of the many new air quality monitoring devices 6 Smart Interior Air Quality Monitors You Should Buy For Your Home 6 Smart Interior Air Quality Monitors You Should Buy For Your Home The quality of the air we breathe is very important for our health and quality of life, and these six smart air quality monitors help to ensure your home air is as safe as possible. Read More on the market. There are plenty out there, but let’s just look at Foobot, as it has a good price point and does very well in reviews. Foobot is an air quality monitoring device, plus an app for your smartphone. The base device looks a bit like a futuristic vase with lighting. It’s the part that has the sensors built-in to check for volatile organic compounds 6 Smart Detectors That Protect Your Family and Property from Harm 6 Smart Detectors That Protect Your Family and Property from Harm A truly smart home does more than save money: it helps protect your family and house. These smart detectors will keep an eye on things so you feel safe when at home or away. Read More (VOCs), particulate, carbon dioxide (CO2) and carbon monoxide (CO), as well as temperature and humidity. There are two ways you can get information from Foobot – its built-in blue and orange lights, and through the Foobot app on your smartphone. You’ll need WiFi in your house Wi-Fi vs. Ethernet: Which Should You Use and Why? Wi-Fi vs. Ethernet: Which Should You Use and Why? The world is going wireless. Does that mean it's all over for Ethernet? Read More for the device to talk to your app. Setting up a new Foobot is very simple as well. Some excellent design went into this product. The device has six tiers of orange and blue LED lights 7 Creative Uses for Colored LED Home Automation Lighting 7 Creative Uses for Colored LED Home Automation Lighting Turning on your lights automatically is certainly cool, but it doesn't take advantage of the full spectrum of colors available with RGB lighting. For that, we need to get creative. Read More . When you see blue, that’s a good thing. The more blue, the better. When you see orange, that’s a bad thing. The more orange, the worse your air quality. To get details, you’ll have to check your smartphone app. The app will show numbers related to the things that Foobot monitors. The numbers might not mean much to you at first, but over time, you’ll get to know what’s good and what’s not so good, thanks to the color coding. The app also has a progressive learning method 4 Machine Learning Algorithms That Shape Your Life 4 Machine Learning Algorithms That Shape Your Life You may not realize it but machine learning is already all around you, and it can exert a surprising degree of influence over your life. Don't believe me? You might be surprised. Read More that tracks the data and can forecast when your IAQ is likely to be better or worse. As you continue to use Foobot, it will also give you tips tailored to your situation to help make your IAQ better. It might be something as simple as keeping the humidity lower, so that less bacteria and mold can grow. 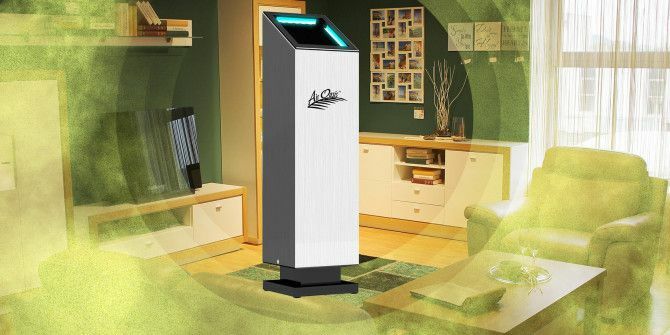 Or, it may suggest that you get a good quality whole home air purifier. It all depends on your situation. That’s probably it’s most helpful feature. If your Foobot is telling you that your IAQ isn’t so good, consider air purification, but not just any air purifier. You could go with a straight HEPA filter 9 Impressive Home Automation Gadgets Family & Friends Will Love 9 Impressive Home Automation Gadgets Family & Friends Will Love With the holidays just around the corner, now is the perfect time to snag one of these amazing smart home devices. Read More . They can catch particles in the air bigger than 0.3 microns. How small is that? A human hair is 150 microns. Few things are smaller than 0.3 microns in your air, except VOCs and viruses. That’s where a photocatalytic oxidizer (PCO) like the Air Oasis Air Sanitizer comes into play. PCOs catch organic compounds like VOCs and oxidize them. It breaks organic compounds down into their harmless components. This process virtually eliminates all VOCs and kills many types of bacteria and viruses. That doesn’t mean your home will be cold and flu free, but it could dramatically reduce the frequency of those kinds of illnesses. When you hear that an air purifier can do all that, it sounds like it’s going to be an expensive item, right? Not necessarily. The technology is established and so pervasive that it has become very affordable. The moisture content of the air we breathe is important. Perhaps surprisingly so. If the air is too dry, you can have dry eyes, nose and throat, chapped lips, and even eczema-like skin irritations. According to a study by Jeffrey Shamana and Melvin Kohn, low humidity can actually help viruses live longer. You don’t want that. On the other side, mold, fungus, dust mite, and bacteria growth can increase if the air is too humid. All those things can cause allergic reactions, irritation of the eyes, nose, or throat, and flu-like symptoms. Ironically, those are a lot of the same symptoms you might get from air that’s too dry. But air that is too humid can also make asthma worse for those that live with it. These things make sense to most people, yet there’s another health problem related to high humidity that you probably don’t know about. Remember those VOCs? A lot of those come from the off-gassing of ordinary things in most homes. It might come from building supplies, furniture, or household cleaners. High relative humidity can increase the rate of off gassing VOCs, effectively releasing more nasty chemicals into your air. The ideal relative humidity range is between 40% and 60%. To get there, you may need a humidifier, dehumidifier, or possibly both. Let’s take a look at one of each. Humidifiers work in two different ways. Some boil water and then the steam goes into the air, thus humidifying it. These are known as warm mist humidifiers. The other kind uses either evaporation, ultrasound, or an impeller to put water into the air. These are known as cool mist humidifiers. One type isn’t necessarily any better than the other at humidifying. They both have filters that need to be replaced, and they need to be cleaned regularly. However, the boiling one does use more energy and isn’t a great idea to have around small children. Consider an Aircare Evaporative Humidifier. This unit can serve up to 3600 square feet, is easy to clean, and replacement filters are less than $15. The best thing about a humidifier like this is that it has a humidistat. That’s like a thermostat 9 Reputable Smart Home Brands With Products You Can Trust 9 Reputable Smart Home Brands With Products You Can Trust The modern world is moving toward all kinds of smart home automation, and the longer you hold out, the more difficult it's going to be when your day of conversion finally comes. Read More , but for humidity. Set it for the desired RH level, and the unit’s sensors will shut it off or turn it on to keep it at that level. If you’re familiar with the way an air conditioner (A/C) works, that’s pretty much the way a dehumidifier works. By sucking air across cold coils, moisture condenses and drips into a bucket. Also like an air conditioner, they can be quite loud and use a lot of electricity. But if you need one, it’s worth it. Just like the humidifiers, look for a dehumidifier that is easy to clean and has a humidistat. Also look for a frost sensor. Because dehumidifiers function a lot like an A/C, they can also freeze up, making them stop working but still running and wasting electricity. You also need a full-tank sensor that will automatically shut it off, because floods aren’t much fun Install a Smart Valve and Stop Your Basement from Flooding Install a Smart Valve and Stop Your Basement from Flooding What if you could prevent home flooding or water damage by installing a single piece of equipment? I am, of course, talking about smart water valves. Read More . If you happen to have a floor drain, a unit with a drainage hose is great. No emptying a bucket or it shutting down when you need it most. Take a look at the Frigidaire 70-pint dehumidifier. Along with great ratings, it’s got the humidistat, frost sensor, full-tank shut off, and a drainage hose. It’s also Energy Star rated, so you know it’s going to save you electricity over non-rated devices. Plus the antibacterial filter is washable, keeping it from being a bacteria breeding ground and keeping money in your wallet 10 Creative Uses for Smart Plugs That'll Make You Want One 10 Creative Uses for Smart Plugs That'll Make You Want One Smart plugs are the most basic element of any smart home. Here are several ways smart plugs can get your dumb appliances online. Read More . As the name suggests, it can pull up to 70 pints of water out of the air every day. How’s This All Going to Save Me Money? So you got the Foobot, the Air Oasis air sanitizer, the Aircare humidifier, and the Frigidaire dehumidifier. You’re breathing easy, sick less often, and allergies aren’t much of a problem any more. That’s nice. So what? Where’s the money you were promised? Have you bought a bottle of Nyquil or Dayquil lately? Get one of each and it’s over twenty bucks! Allergy shots can cost from $200 to $800 a year, maybe even more! But that’s not the kind of savings we’re talking about. Having your indoor air quality tuned can save you money on your power bill 3 Alternative Energy Home Projects That Could Slash Your Electric Bill 3 Alternative Energy Home Projects That Could Slash Your Electric Bill Let’s take a look at how we can take on some simple alternative energy DIY projects and save tons of money. Read More . The air sanitizer keeps your furnace filter from getting clogged up so quickly. A loaded filter makes your furnace or A/C work a lot longer to maintain your room temperature. How much? It’s hard to say since there’s so many different types of furnaces. Even if it’s only 5%, that’s $50 on a yearly $1,000 heating and cooling bill How a Smart Energy Monitor Can Save Money And Give You Peace of Mind How a Smart Energy Monitor Can Save Money And Give You Peace of Mind Smart energy monitors tell you how much electricity your appliances use, and how much money you could save if you turned them off. They can also help you create clever smart automations. Read More . Not much? Read on. Water conducts heat better than air, so the amount of water in the air affects how it feels, temperature-wise. According to the Home Energy Center, in the summer, air at 78°F and 30% RH provides the same level of comfort as it does at 74°F with 70% RH. So your A/C can run 4°F warmer, meaning it runs less, and you keep your cool. In winter, air at 68°F with 60% RH are just as comfortable as air at 72°F with 30% RH. Again, a 4°F difference, making your furnace run less, and your nose stays warm. So a 4°F change on your thermostat means a 12% savings on your bills. How much does that mean to you? That drops your $1,000 a year heating and cooling bill to $880 a year. Not bad. Who doesn’t want to be healthy and rich? Image Credits: Colorized transmission electron micrograph of Avian influenza A H5N1 viruses, 50 USD Series 2004 Note Front, Ovolo 2AR living roomvia Wikimedia, Inhaler, via Flickr, Bundle of dollars in a hand, via Torange, Color smoke set, Standing in the Office with Gas Mask, Water Drops from Home Condensation on a Window, Woman Having Breathing Difficulties in the Living Room, via Shutterstock. Then you open your doors a couple times per day and let everything back in. Some little stand alone stick is not going to clean the air in your house. Expensive HEPA filters are just as useless. Your shoes, clothes skin and hair all contain all the junk from work and outside as well. This is problem that doesn't need a solution. Whole house purification might give you a fighting chance. You are spot on with humidity though, so there's that. Thank you for reading. I do appreciate that. If opening the doors allowed for a complete circulation of the air in the house with the outside, yes, filtration and purification would be useless. But that's not the case. The amount of air exchanged might be 30 cubic feet. I'm guessing. The air in a 200 sq.ft. room could be as much as 1,600 cubic feet. Going through doors isn't going to cycle all that out. Even if that room was the one with the door to the outside. What you say about shoes, clothes, skin, and hair containing junk from outside is true, too. But again, the amount that comes in on us from the outside is so small that it's not going to render filtration or purification useless. But, it's a personal choice. It's up to you to decide what's best for you. Lifx vs. Philips Hue Smart Bulbs: What Are the Differences and Which Is Better for You? Phone vs. Universal Remote Control: What’s Best for a Smart Home?